We’ve had quite a few posts about the awesome parts of dog ownership recently, perhaps it’s time for another side. In Rhode Island, a family’s pitbull got out of the back yard and went on a rampage which left three children injured, one hospitalized, and some pretty incredible security camera footage in its wake. 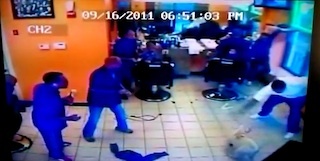 The footage is from a small barber shop that the dog got in and began attacking the patrons and employees. Yeah, consider this a post for the cat people out there. Below you can watch the news report from WPRI in Providence in which the owners say they are incredibly sorry and are stunned this occurred. There’s also a quote from someone in the shop who said it was incredibly scary because they had nothing to defend themselves with. And, to prove his point, below the report is the full raw video which shows a man attempt to fend off the dog with a hair drier. Hey, points for being resourceful.